Looking to bring your rides to a whole new level with full suspension mountain bikes for trails? Well, read on. We’ve gathered some of the best full suspension mountain bikes you can actually buy. Consider these if you want to take your rides up a notch. Here, you can find bikes from under $1,000 to much higher price points, with top-notch quality components. These are versatile workhorses that you can use to discover the best trails hidden all around the place. What is the best entry level full suspension mountain bike? Do you know? We do. Please keep in mind that building a full-suspension frame raises the costs of the bike. So, when it comes to expensive bikes, you have to cut the costs somewhere to offer them at a more affordable price. In this case, the wheels are quite heavy. Also, the front suspension and fork are entry-level parts that aren’t meant for rough use. If you plan to take the last out of your bike, scroll down. If you plan to make your first steps into the FS world, then go ahead and try it. Here we have the Diamondback Atroz, which leads entry-level riders into the dual suspension world with ease. The Atroz series is meant as a starting point in the full suspension world, and there are also models 1 & 3 available. We actually haven’t found any similar picks in the price range of under $1,000. Since Diamondback is known for making better and better bikes each year, this is why this Atroz 2 model is here. It’s not the best full suspension mountain bike, but it’s one of the best choices for beginners! Thanks to a steep head tube angle of 66.5 degrees, the handling is precise and perfectly suitable for XC trails, which is what most beginners do. It has 120mm of front travel provided by SR Suntour XCM. Not the fanciest but still gets the job done. The rear shock is from the same quality class with plenty of travel. The single-pivot design offers smooth and durable performance. When choosing an FS bike for a beginner, make sure it has hydraulical disc brakes (like this one). On the downside, there are only three sizes that suit riders between 5’4″ to 6’1″. The Cannondale Habit 5 is a stealth-looking FS bike that will make itself visible on the trail in numerous other ways. The most important of which are elegance, great components, sturdy 29″ wheels, and versatile capabilities. The Habit 5 model is a member of the Cannondale Habit series, which includes six men’s and three women’s models. This is a full aluminum bike that offers outstanding value for its price which reflects in the carefully picked parts. Moreover, it has a ton of travel, which makes it a serious pretender on the trails. If you’re an experienced trail rider or you’re planning to become one, the Habit 5 bike is for you. It offers 130 mm of travel with its RockShox Sektor RL fork and the same amount of rear travel thanks to a Fox rear shock. If you want to have a bike that’s versatile and capable of riding different styles, it’s good to know that Habit 5’s rear suspension is adjustable in three positions that can completely transform the character of this bike. It’s able to perform well both on technical trails and on bombing descents! Cannondale Habit 5 is known as an “XC bike on steroids” thanks to the perfect 66-degree head tube angle that allows the bike to react the moment it gets input from the rider. Other positive aspects include a dropper post, powerful Shimano hydraulic brakes, and a wide range 11-speed drivetrain managed by a Shimano SLX shifting system. The only consideration with the Habit 5 bike is its weight, which is a bit higher than ideal due to the massive 29″ wheels and wider tubing. However, responsive ride balances the weight out, so you won’t feel it much when riding. If you still haven’t considered this modern European manufacturer as your next bike’s supplier, maybe it’s time to change that. We’ll try to do it by showing you the fantastic Ghost FR AMR 6.7 which is this company’s entry ticket into the Free Ride bike scene. 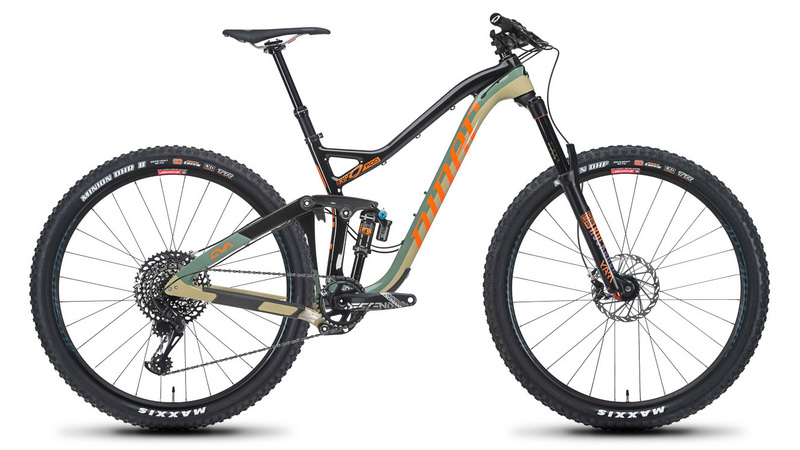 The FR AMR 6.7 rides on par with the most expensive trail bikes, but comes at a lower and more affordable price compared to the same class of bikes made by the competition. We can thank its aluminum frame for this, which is quite stiff and does not increase the weight too much. One thing that puts Ghost FR AMR 6.7 in the Free Ride category is the luscious 170 mm of travel on the FOX fork, combined with 160 mm of travel on the FOX DHX2 rear shock. This is a coil shock, so it might cause you problems if you need a different-weight coil. This bike has a slack head tube angle of 64.5 degrees which makes it ride really well on the descents and roll over obstacles with its 27.5″ wheels. On the other hand, the seat tube angle is quite steep, which makes this Ghost a great climber as well, as you will need to get yourself up those hills before you can go down. Let’s also not forget the SRAM GX Eagle 12-speed derailleur operating on a 10-50T cassette, with a rich gear ratio for any hill profile. The brakes are Madura MT Fifty4, which have an impressive stopping power in all conditions. Niner is one of the companies in the industry that stood behind the benefits of 29er bikes and put a lot of effort into popularizing them and bringing them closer to riders. The Niner RIP 9 RDO 2-Star is one of their aluminum masterpieces with lots of amazing features to support you on your way to the top of trail riding. First of all, you should learn about the RockShox Yari RC Solo Air fork with 160 mm of travel, which is more than enough to get you over any obstacle on a high-paced run down the trail. It’s also comes with a FOX Float DPX2 Performance EVOL rear shock with 150 mm of smooth travel. When you get it out on the trail and the suspension starts working its magic with the help of the intimidating 29″ wheels, you will realize that its price is more than justified. Moreover, this Niner RIP 9 RDO is customizable, so you can fit it with 27.5″ wheels as well if that’s what you prefer. The steep head tube angle od 66.5 degrees puts you in a more upright position and in more control of the action. The handling is very responsive, so any experienced rider will be able to create magic in the corners on this XC machine. This Niner model also boasts high-end SRAM components, including SRAM Guide R hydraulic disc brakes, which come as one of the best options on the market, and a SRAM GX Eagle 12-speed drivetrain that will let you pedal where you thought it was impossible to do so. It’s the perfect way to go if you have big dreams and big capabilities and you need a quality XC bike that can keep up with your pace! Finally, we get to the first full-carbon bike on this list, and it’s a great model to break the ice! 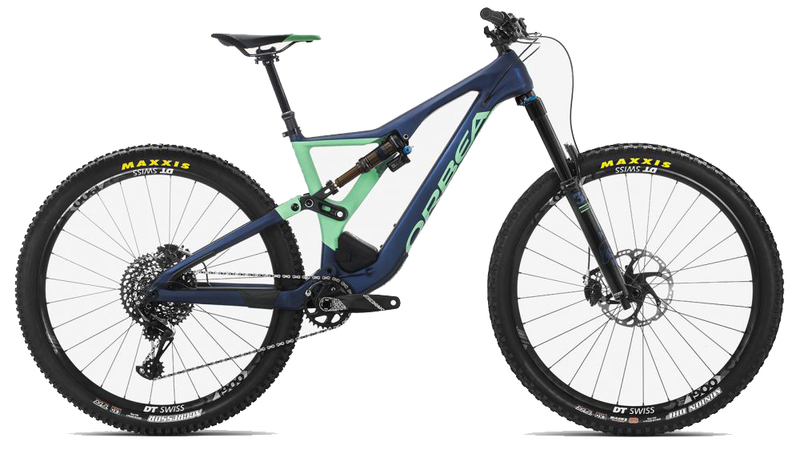 Orbea Rallon M10 is one of the models from Orbea’s carbon Rallon series aimed towards experienced enduro riders who want to get as much bang for their buck as possible! The Rallon M10 is made for fast rides on challenging enduro trails that demand both guts and skills. It comes with 29-inch wheels, which makes it perfect for quick descents. However, there is no 27.5″ version, which makes it less customizable, and it’s something that a lot of riders will not like. The biggest highlight on Orbea Rallon M10 is its suspension, as both the front and the rear suspension is adjustable in three positions. The fork is a Fox 36 Float Performance with 160 mm of travel, whereas the rear shock is a FOX DPX2 230×60 mm. You can select the perfect setting for any trail that you ride, which will help you break boundaries and reach new heights on the trail. The Rallon M10 has SRAM components, including a 12-speed drivetrain with a 10-50T cassette. However, there is no Shimano drivetrain option, which some riders prefer. The Orbea Rallon M10 comes with a relatively slack 65-degree head tube angle, but since it features 29-inch wheels, it’s able to conquer any rocks, tree stumps, and other obstacles you put in front of it. If your ideal trail ride involves a lot of enduro riding and a lot of challenging downhills that get your heart pumping hard, Orbea Rallon M10 will be your best friend. A high-quality carbon trail bike for much less than $5,000? If you’re wondering whether or not you’re reading that right, you certainly are. Diamondback is shaking the market with this affordable yet high-end XC machine that we can best describe as FUN! The Diamondback 5C is an outstanding enduro bike that features 27.5-inch wheels, stiff and responsive handling, and high-end race-category SRAM XO1 components. When you’re on the trail and hitting the downhill part of the track, all you will be worrying about is travel. Luckily for you, the 5C boasts a Fox 36 Performance Elite Float fork with 150 mm of travel and three available positions. Therefore, you will have a setting to choose when climbing, descending, and when doing tight technical bends. However, you might find the rear travel to be lacking, as it provides just 130 mm. 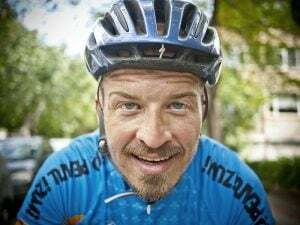 At first, this might hold you back from going as fast as on an enduro bike with much more travel, as there is no replacement for this problem. However, this is one part of what makes Diamondback 5C so fun to ride. The head tube angle on the 5C is 66 degrees, which is a bit steep, but makes this bike an excellent climber and a perfect all-rounder. 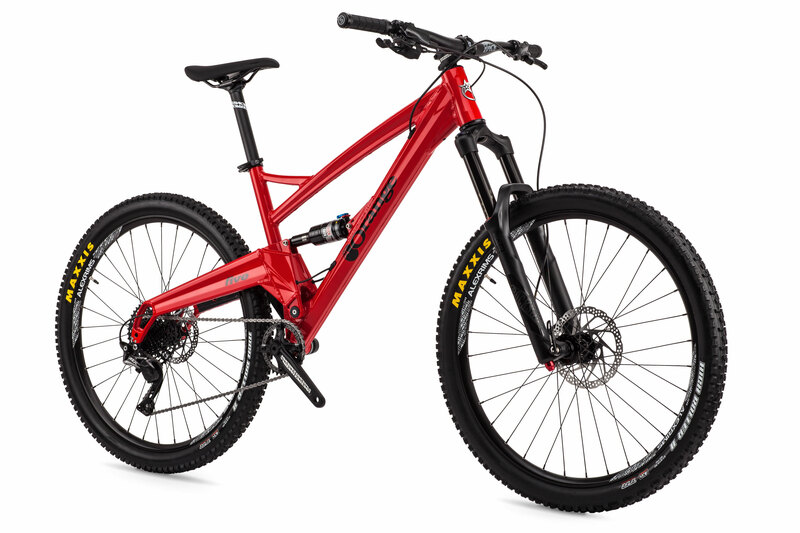 On top of all of that, this Diamondback model comes with ultra-strong SRAM guide RS hydraulic disc brakes with 180 mm rotors, as well as Race Face ARC 30 mm rims. It’s a combination that translates to confidence on the challenging trails. Not many bikes will give you this much for such an attractive price. If you’re from the UK and you want to support the domestic bike industry, the Orange Five S is a strong contender. However, there are many more reasons why you should shortlist this interesting FS trail bike, one of which is the fantastic price and even better value that you get for it. 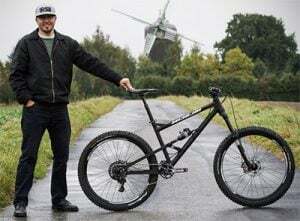 The Orange Five S bike has a durable, stiff, and responsive frame hand-built in Yorkshire that’s equipped with a RockShox Yari RC Boost fork with 150 mm of travel. On the rear, your bottom will be suspended by a RockShox Monarch DB RT, with more than enough travel as well. Therefore, you will have nothing holding you back from reaching record speeds on the downhills. However, one of the reasons why this Orange model is available at such a competitive price is its weight. It’s a bit bulkier and heftier than ideal, which shows when you’re hitting those gruelling hills to start a DH ride. But, when you’re going fast, the ideal XC 66-degree head tube angle balances everything out and puts you in full controll of the situation. The Five S is available with 27.5″ wheels and the stock tires are Maxxis High Roller II, 2.3″ wide, which are fast and supportive when cornering. Finally, Orange Five S has a Shimano SLX setup, which is a mid-of-the-range groupset, but its 11 speeds will be more than enough to take you and this beauty up any hill. The bottom point is that this is a versatile and affordable bike that is a great choice if you like mixing styles and want to have a do-it-all solution. The Cannondale Jekyll 3 is a carbon/aluminum bike that can be both Jekyll and Mr Hyde on the trails, depending on how you want it to act. This bike is an improved version of the previous model, with 29-inch wheels that put it in a completely different dimension when you’re out on the trails. The Jekyll Carbon AL 3 has a very high bottom bracket which means that you can finally start going more “over” obstacles, than trying to find a way “around” them. It’s a great choice to tackle rockier terrain thanks to the higher ground clearance. For $4,000, this Cannondale XC bike is a bargain considering what you get in terms of components and performance. What impressed us the most and what you’ll like the most is the Gemini rear suspension with a remote lockout. This allows you to quickly switch between two suspension profiles: short (Hustle) and long (Flow). The short setting is fantastic for long flat trails that require a lot of pedalling or long and arduous climbs. However, one thing that you should consider is the Fox Float Performance 36 fork with 150 mm of front travel, which puts the handlebar lower than ideal. When descending down steep hills, you might feel that you are leaning forward too much. But, the head tube angle is 65 degrees, which is just in the middle between making this bike an Enduro and an XC model, so it makes it more versatile. One thing is out of the question; you’re bound to fail if you try to find more value at this price point in another bike. Long gone are the days when men dominated the trail scene of mountain biking. Women are taking over, and to do it successfully, they need the right tools. One of these is, without a doubt, the Yeti Beti SB5 Carbon GX Eagle bike. 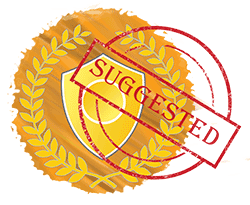 It has quite a long name, but it balances it out with a long list of positive features as well. Even though the ideal number of bikes in your garage is n+1, this Yeti model is adamant about changing that, as it is an all-around capable model that does well in the XC sphere and on technical descents. You can confirm that if you consider the Fox Performance 36 fork with 150 mm of travel and 127 mm of rear travel provided by Fox Performance Beti DPS rear shock. This is just the right amount of travel for this bike to act well both on long technical climbs and rampant downhills when you need to give all you have. The price does look a bit steep, but for $5,000, this Yeti model just never stops giving and surprising. The head tube angle on the Yeti Beti bike is a steep 66.5 degrees, and the seat tube angle is 73.7 degrees, which is a bit too slack when you’re riding up very steep climbs. However, this Yeti Beti XC monster comes with a 10-50T SRAM GX Eagle 1×12 drivetrain, with a granny-gear that will never leave you lacking the right cadence for any hill. The stopping power is ensured by SRAM Guide hydraulic brakes with 180/160 mm rotors. This Yeti Beti comes with a high price, but it comes with an ability to meet and exceed high expectations as well! We can wrap up this list with another excellent women’s trail bike that easily proves its worth on the rides. 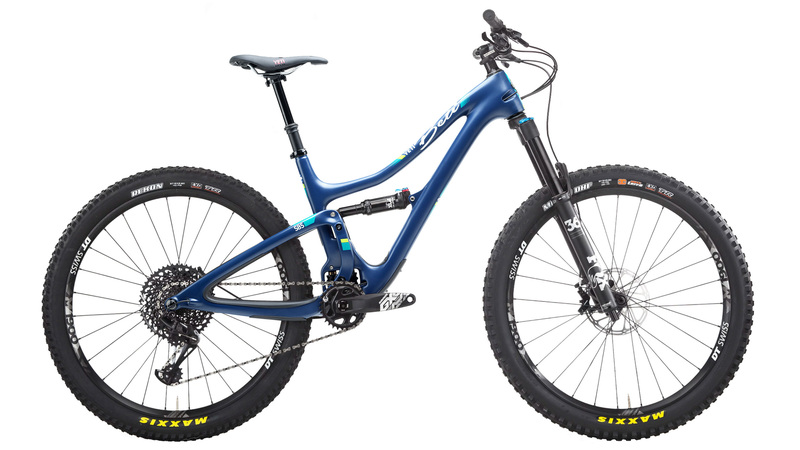 Ghost Lanao FS 2.7 is a mid-range full suspension bike with a very reasonable price and several aces up its sleeve. If you’re an XC enthusiast who’s looking to have as much fun on the trails as possible but not to spend too much, Ghost Lanao FS 2.7 meets your needs. This is a versatile 27.5″ aluminum XC bike intended for a little bit of everything on the trail. It has 130 mm of both front and rear travel provided by an SR Suntour XCR 34 coil fork and an SR Suntour air rear shock. This won’t let you go absolutely berserk on the downhills, but it’s more than enough to deal with most obstacles on moderate rides. Ghost Lanao has a steep head tube angle of 69 degrees, which is perfect for XC rides. It ensures a nimble, springy, and responsive ride, and you will truly feel the response of the bike to every bit of input you give it. However, considering that Lanao FS 2.7 has a very affordable price, it has a slightly higher weight as well. The hydraulic disc brakes are provided by Tektro and not Shimano, but they do a fantastic job at supplying you with more than enough stopping power at demand. All in all, if your expectations are realistic and you want an affordable women’s XC bike that can do a little bit of everything, we believe that this Ghost Lanao model is the one. We’ve analyzed thousands of bikes so far which has taught us a lot of details about them, so we can help you out to make the right choice. If you are making your first steps into the FS world, then choose the Atroz. But, if you’re updating to a more capable aluminum bike, the Cannondale Habit 5 is for you. If your ideal type of mountain biking is free riding or riding in parks, definitely check out the Ghost FR AMR 6.7. However, if you’re looking for a more versatile bike that you can switch between 27.5″ and 29″ wheels, then the Niner RIP 9 RDO 2-Star is for you. If you have money to spare and you want a top-of-the-line carbon 29er, the Orbea Rallon M10 will make you happy. On the other hand, if you want a more affordable carbon all-rounder that’s fun and challenging to ride, choose the Diamondback 5C. The Orange Five S is a great English-built bike that you can buy if want an affordable 27.5″ XC machine. If you want the best suspension setup you can get on this list, then the Cannondale Jekyll is the right pick for you. Finally, if you’re looking for a women’s model, you can either go with the Yeti Beti if you have the money to spare and you want top-notch quality or choose the Ghost Lanao FS 2.7 if you wish to get great value for little money.